The Vee Plough is an economical free floating returns plough and is best suited installed prior to any returns belt pulley, tail pulley or loop take up installations.It has a robust construction, allowing for easy installation and recovery if needed. 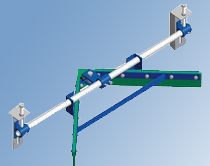 The system is supported by four chain anchor points to fix to any conveyor structure, thus allowing the unit to free float with varying belt conditions. Features: Easy blade replacement, economical, ease of installation, free floating. The Diagonal Plough has all the same features as the Plough above, however one blade assembled to the unit is designed to cover the entire width of the conveyor belt. This unit allows for all the materials removed by the plough to be deposited to the desired side of the conveyor belt. The Diagonal Plough is easily changed from a right hand side configuration, to a left hand side unit, as all the cleaner blades are interchangeable. 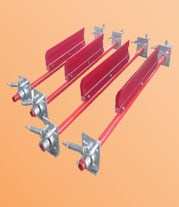 Features: Single direction discharge, economical, ease of installation, free floating. The Plough Type Belt Cleaner is a proven design that offers effective cleaning of the return belt, ease of maintenance and installation. 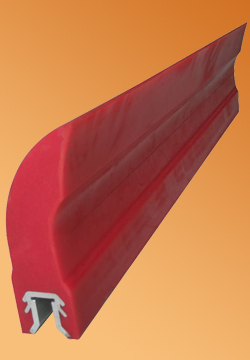 - Profiled urethane, replaceable, blade offers effective cleaning and protection of return pulley. 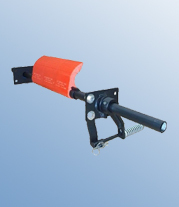 - Unique urethane tensioning system provides optimal tensioning of plough against belt. - Ideally suited to use on belts with mechanical fasteners. - Simple design of fabricated items provides ease of installation, maintenance and blade replacement.